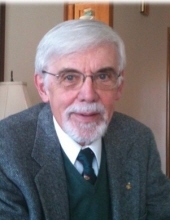 Larry L. Dow was born on March 2, 1942 in St. Paul, Minnesota to Leverne and Betty (nee Franks) Dow. He died Sunday, January 20, 2019 at Autumn Leaves of Vernon Hills. Mr. Dow worked as a Systems Programmer Analyst for Walgreens for over 25 years. He served in the United States Army from April 1962 through April 1965 with the 173rd Airborne. He was a member of Orchard Evangelical Free Church. He was a devoted husband, father and grandfather. Some of his happiest moments were spent with his grandchildren who loved him dearly. Larry is survived by his wife of more than 39 years Marijeanne Dow (nee Mayo); his children Chuck (Alyce) Dean, Susan Owen, Scott (Deb) Dean and Andy (Dawn) Dow; his grandchildren Rob (Melinda) Andrews, Bailey Dean, Anthony Dow, Grace Dean, Quinlan Owen, Rachel Dean, Paige Dean, Ainsley Owen, Logan Dow, Jacqueline Dean as well as his great-grandchild Bobby Andrews; his sister Sandra Griffin; he was also survived by several nieces and nephews. He was preceded in death by his parents as well as his sister Marylin Erickson. Visitation Friday, January 25, 2019 from 10:00 am until time of Funeral Service at 11:00 am, Friday, January 25, 2019 at Orchard Evangelical Free Church, 1330 N. Douglas Ave., Arlington Heights, IL 60004. Interment will be at Arlington Heights Wheeling Township. In lieu of flowers memorials may be given to the Ann and Robert H. Lurie Children’s Hospital of Chicago Foundation Dept. 4589, Carol Stream, IL, 60122 https://www.luriechildrens.org/en-us/about-us/Pages/our-foundation.aspx. "Email Address" would like to share the life celebration of Larry L. Dow. Click on the "link" to go to share a favorite memory or leave a condolence message for the family.